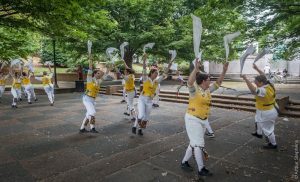 Readers who enjoyed Jim Voorhees’ October blog post learned about the close connection between Morris dancing and Revels — but what is it like to be part of one of Washington’s Morris teams? Since the Rock Creek Morris Women will perform in The Christmas Revels this year, we thought it would be fun to keep the Morris conversation going and learn more about the dance — and the dancers — you will see this December! 1. How long has Rock Creek Morris been dancing, and how did you get started? Morris dancing came to DC through a variety of people. Foggy Bottom Morris was started by an Englishman who had learned the dance in St. Albans, Hertfordshire. Mary Chor, our founder, (who will be with us on stage this year) had danced in Western Massachusetts during college. 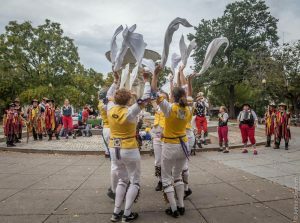 Men and women joined the first team, but the women were not satisfied with being “Foggy Bottom Women” and, under Mary’s leadership, the Rock Creek Morris Women was born. The team will celebrate its 40th anniversary this year! 2. Morris teams are called “sides,” right? Can you describe the makeup of a side? Do dancers have different roles? Who is in charge? Morris Sides (it’s OK to call them teams as well) are made up of dancers and musicians, traditionally from a village or extended family, but in more modern times made up of a group of people with shared interest in dancing together. Team leadership is loose and has evolved over the generations. Generally, there is a “squire” who is in charge of the logistical leadership of the team, a “foreman” who is responsible for teaching the traditions of the team (styling, stepping, distinctive figures, etc. ), and a “bagman” (treasurer). Modern teams obviously have other jobs (no team in 1599 had a social media manager, for example!). These positions are usually democratically elected. The titles probably come down to us from the days when teams were formed by working class people who danced as part of their social activity, in the streets and pubs of the village. Morris dancing originated in the Cotswolds Hills region of England (around Oxford) and the traditional dance styles are named after the villages they came from. Rock Creek will dance a stick dance in the style of Fieldtown in the Revels this year, and you’ll see us throwing sticks across the stage! This is only one of the many Morris styles we perform. They will also dance the Abbots Bromley Horn Dance, which comes from the village of Abbots Bromley. Morris is usually danced by a set of six dancers with one or more musicians to play the tune. It is always danced to live music and the musician is a full team member, often a dancer or former dancer. This year we are joined on stage by Reveler, Foggy Bottom Morris member, and Rock Creek band member Alan Peel. The dances are designed to be performed with either large hankies that wave, float, or snap depending on the dance, or sticks that are clashed or tossed. All the dancers wear bells on their legs that provide the percussive element to the dance. The dancers themselves should be able to dance every position in the set seamlessly while preserving the team’s styling. Some teams have Fools — dancers who work around and through the set, engaging with the other six dancers and engaging the audience through their antics and physical humor. Mark Jaster, who plays Will Kemp in this year’s show, has sometimes “fooled” for our team. 3. Where do you dance? Do people seek you out for performances, or do they just “happen”? Morris is a living tradition that is actively practiced and shared through spontaneous performances on the street and gatherings of dancers from around the region and the world. Our local teams “dance out” in DC and in towns around the region, sometimes on our own, sometimes with another regional team. We often travel to other cities for bigger, weekend-long events called Morris Ales. As many as 20 teams will gather together and spend the weekend touring the nearby towns, dancing together, singing together, and being in community. Once every few years one of our teams organizes a trip to England where we tour with local teams and expand our connections in the worldwide Morris community. 4. According to Jim’s blog, there is a misconception that there are only Morris “men” — why do you think this is so? Can you talk a bit about the history of women and Morris? The beginnings of Morris dancing are lost in the mists of time. We know that Shakespeare mentions it in several plays and that Will Kemp wrote about his “Nine Days” Morris dance. In his account he mentions dancing with women in villages along the way. In many villages it was the men who danced the Morris, perhaps as a form of social club. Each village had its Morris side, and so, like so many bands of brothers, they enlisted together in World War I and were also lost together. During those dark years, women continued to dance the village traditions and so provided the link between the past and present. In the 1960s and 70s the Folk Revival renewed interest in traditional dance. Morris teams were revived or newly founded in England, Canada, the United States, and many other places. There was a faction that insisted that Morris was only a men’s tradition, but history and the superb dancing of many women’s teams has proven them wrong. Rock Creek was among the first women’s teams founded in the United States in the 1970s. 5. How many women’s Morris groups are out there? Are there women’s “leagues,” or do you compete against men’s teams, too? There are as many women’s teams as men’s teams at this time of history. That was not always true, especially in England. Until recently there were separate organizations of Morris teams: The Morris Ring was for men’s teams only, and the other, The Morris Federation, for all teams. Recently, The Morris Ring has given up it’s “men only” requirement. The US does not have anything similar. All teams are independent. Morris dancers are a strong community of musicians, dancers, and singers who to get together to enjoy each other’s creative efforts and to celebrate our common interests. It’s about community, not competition. Our participation in the larger “Ales” gatherings is competitive only in the sense that every team wants to put their best foot forward and impress the other teams with how synchronized and polished they are. Beyond that, each time we gather with other teams there is more of a spirit of reunion than of competition. 6. Has anyone from RCMW been involved in The Christmas Revels before? What are you looking forward to about this year’s Elizabethan show? Rock Creek has danced in several Christmas Revels productions and many May Revels celebrations. Our most recent appearances were dancing Northwest Clog Morris in a previous Northlands show, and Shepherd’s Hey, a hankie dance, in a Victorian show on the Lisner Stage. Three years ago, Crystal Bailey and Libby Chamberlin began appearing as dancers for the “Lord of the Dance.” Libby Chamberlin grew up performing with Revels North in Hanover, NH and Liz Spilsbury, Guen Spilsbury, and Alan Peel have all played roles and been part of the Washington Revels chorus in multiple Christmas Revels productions. Jenni Swanson Voorhees has been directing the Revels Children’s Chorus since 1991, in addition to many other production roles over the years. This year we look forward to dancing both a Fieldtown stick dance, the Abbot’s Bromley, and the Lord of the Dance. In addition, several of us will have the pleasure of serving as part of Queen Elizabeth the First’s entourage. We always enjoy working with Mark Jaster and look forward to collaborating with him. 7. What attracted you to Morris dancing in the first place? I was walking across the commons in Amherst, MA, one day in 1976 and came upon a group of joyful, exuberant, athletic dancers waving hankies and moving about their set in time to an accordion and fiddle. They were having such fun and the small crowd that had gathered to watch was so entranced, I knew I had to try it. Although they were a men’s team from Boston (New Cambridge Morris Men), as luck would have it, their accordion player was moving to the Amherst area and wanted to start a new team. I came to the first practice and was hooked. What drew me to Morris dancing was how it was something very odd and English-folky, which had been an interest of mine for years. I think my first true exposure to Morris was watching Beltane Border Morris dancing in the fog (watch that YouTube video) and I realized just how much this ticked all my boxes. I was attracted to Morris because both the dancing and the team looked fun. I enjoyed dancing growing up, and was looking for something to do in a new city, so I joined after I saw Rock Creek dancing at the FSGW Mini-fest and they asked me to come to a practice! I stayed interested in Morris because I really fell in love with the dancing and the team! Having such a loving and committed sisterhood has been incredible as well. 8. How often do you practice, and where? The Rock Creek Morris Women practice every Wednesday in Takoma Park. The Foggy Bottom Morris Men practice every Thursday, also in Takoma Park. Both teams welcome new members who would like try the dance and the community. It is a good work out and a lot of fun at the same time! 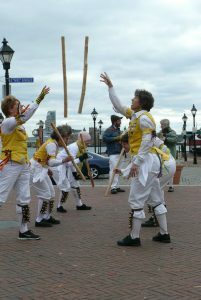 You can learn more about what we do — and stay in touch — at: Rock Creek Morris Women (Facebook), @rockcreekmorris (Twitter), and The Rock Creek Morris Women (Website).